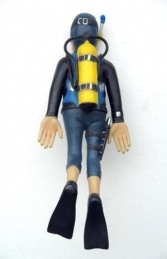 This 3ft long model is ideal to be used within any Scuba or Diving shop where there may not be room to hang our 6ft Funny Swimming Scuba Diver (JR FW). 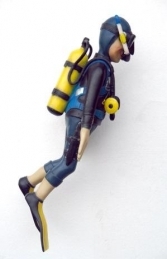 He can be suspended horizontally or vertically or against a wall. The details on this 3ft Funny Swimming Scuba Diver are excellent; you would never believe his wetsuit, fins, stab jacket and knife were all made from resin. 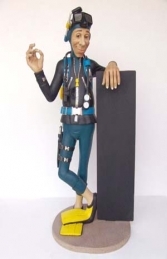 We have made this model with humour in mind, he's a great little character.